It was a normal day. One an awful lot like any other. The kind of day you wouldn’t even recall any details of a day or two later. Eric Walters and his wife were vacationing in Henderson County North Carolina. Walters was out for a walk on the nearby trails with their Yorkshire Terrier Zippy. According to Walters his ordinary day suddenly turned extraordinary. He spotted a bear not far away crossing a field. That was enough to turn typical into memorable. Wanting to capture the moment Walters did what most of us would these days. He reached for his phone to take a video of the bear. But that’s when Walters realized there was something strange about this “bear.” Something was off. The bear wasn’t moving quite right for a bear. Walters, who had just started filming the “not bear,” panicked. “Oh my god,” he repeated hysterically. And for good reason. Most of us would have done the same. He was witnessing a Sasquatch, Bigfoot himself, in the flesh, according to Walters. His brave little Yorkie, Zippy, clearly sensing Walters’ panic sprung into action. 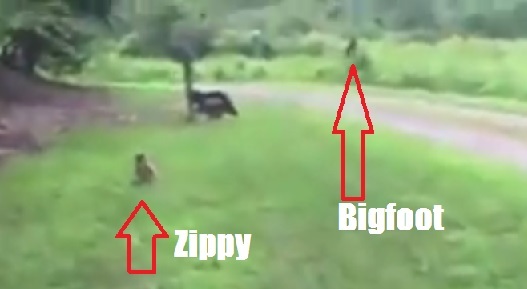 He pulled away from his beloved owner and challenged Bigfoot with a barrage of barking. Now some say, Bigfoot is, by nature, a non-confrontationalist. And who knows, maybe he is. But if you ask Walters he’ll tell you Zippy saved his life that day. In fact, you can hear Walters thanking for scaring the big beast away in the video he shot of the extraordinary encounter. 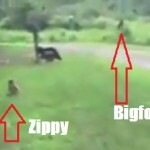 Click to watch Walters and Zippy meet Bigfoot. Previous Post Previous post:This just in…planets are gorgeous!